I do, and I didn't realize just how many I had till I started rearranging the pantry and closets yesterday. I guess I sort of take them for granted, but when I think about it, it's amazing how much trays are a part of my home, both for function and "style". Here are a few of them...some you may have seen before, so I tried to gussy them up...or unload them for the photos. I've had these bamboo trays so long that they're back in style! Does my tray look vaguely familiar? I did an OMG and a giggle when I saw the February issue of the Pottery Barn catalog. That's my tray!...I mean...their tray. Would you believe I bought them in the late 1990s? You can see them a little better in a post I did last March, called True Confessions...click here to see it in case you missed it. I don't use this tole tray a lot...except for decoration. It lives on the shelf in the laundry/storage closet, and it's always so cheery when I open the doors to do laundry. 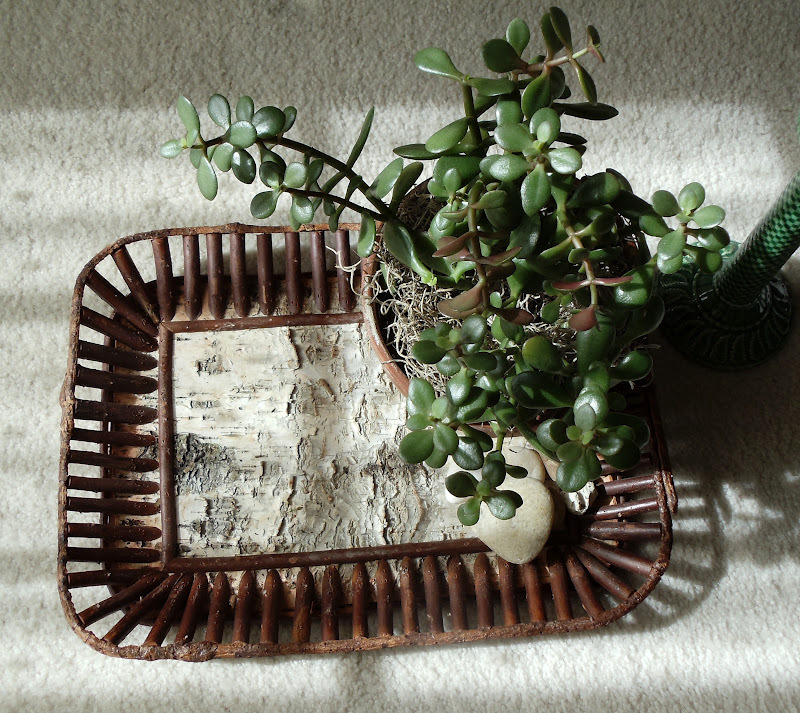 This tray is made from birch bark and twigs, and I use it in Winter to set my plants near the sun. I took the other pots off so you can see the neat look of the bark. Look!! 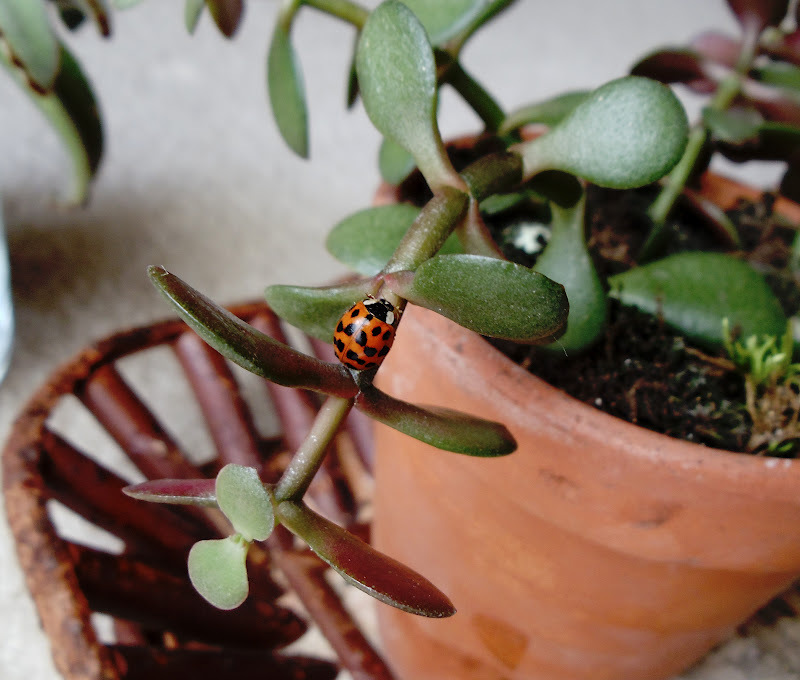 a little Ladybug was on my plant, and I have no clue where it came from. The plants have been in the house the whole time...except for the moss. Since it's so warm here today, I put the ladybug outside on some bushes. Hope she likes it out there. I've got this teak sandwich tray when we lived in Germany. It's just the right size for crackers and cheese. Do you recognize the cute tea towel with it? It was a gift from Debbie @ Confessions of A Plate Addict and I LOVE it! Thanks Debbie. Here's the last one I'll show you for today. Don't want to bore you to tears. This is one we use on top of an old table in the family room. The tray should have legs, but since I found it at GW, none were with it. I'm not really complaining, since it only cost $6. So, I'll keep looking for legs, or a different table, but for now it serves the purpose. That's it for now. I'll show you more trays another time. Babs, What a great collection of trays you have going. That's pretty funny that your tray is making a comeback in PB. I want more trays, but just haven't seen anything in the stores I like. Too much plastic. Love your trays and we have had ladybugs coming in for awhile. They usually are always in the upstairs guest room. I guess they found a way in. Love your trays Babs especially that bark one, such a pretty collection! That proves what goes around comes around. Babs, what great trays!! You have quite a collection! The more I thought about it, I guess I do have quite a few. After seeing yours, I may need to pull them out and use them more! Loving that last dog tray Babs! You got such a deal! I love trays also and have quite a few! Yours are all so pretty. Oh, so many lovely trays! My favorite has to be the twig and bark tray, dear friend! Bored...never! I'll be back soon to see your other trays! Thanks for stopping by. I love trays, too, and don't even want to count them because it might be embarrassing! 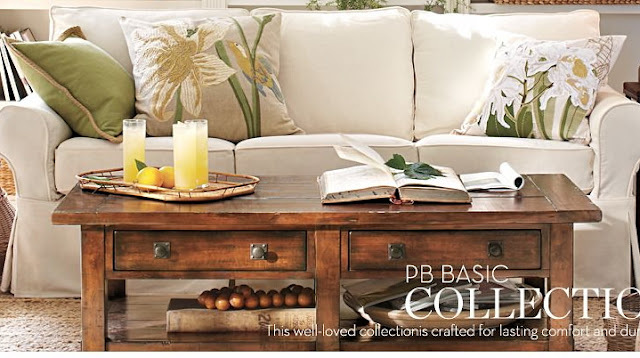 Personally, I think your sofa and pillows are every bit as pretty as the PB ones. My favorite tray of yours (and I liked them all!) is that gorgeous birch and twig one. I always keep my eye open when thrifting for trays. Fun post! I remember that tray like you have with the bamboo edges! They used to be sold everywhere. It's so funny to see stuff come back around as if it's new again. 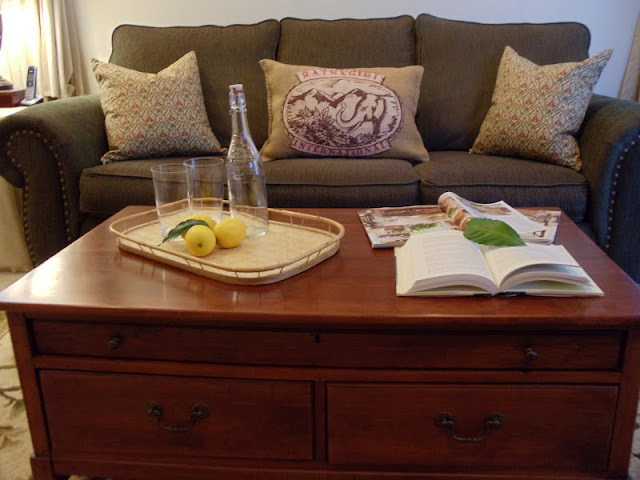 Yours looks great on your coffee table like that. I love your pillows on your sofa too! I still love that elephant burlap one. Trays are such a useful item to have in the home. I tend to keep all of mine even if I'm not using them. You just never know when you'll need one! I love trays and they are so much fun to use. I have lots of them at my gift shop. I often take one home and use it and then bring it back. Makes it nice, not to have to store them all. Love tole the best. Richard from My Old Historic House. Great post, Babs! 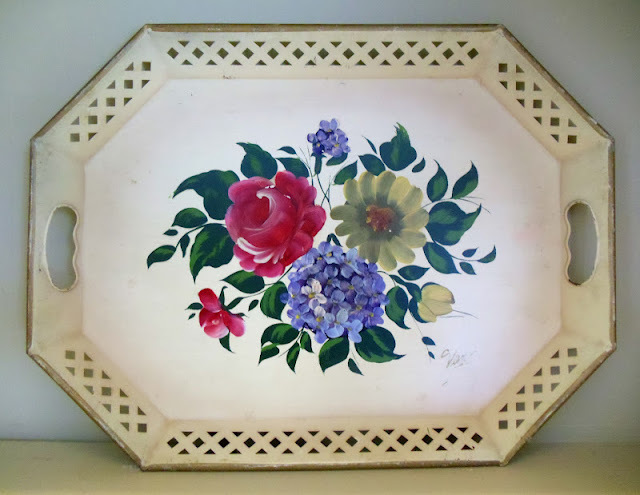 I also adore trays and wish I owned more. I have a dark green tole one similar to yours, and it's on my bench-serving-as-a-coffee-table right now, stacked with books, a brass bowl, and a candle. How fun to spot YOUR tray in a PB catalog! Love the way you've styled it! I do recognize that first tray :) A group of friends all had a few and then we combined all of them for big parties. 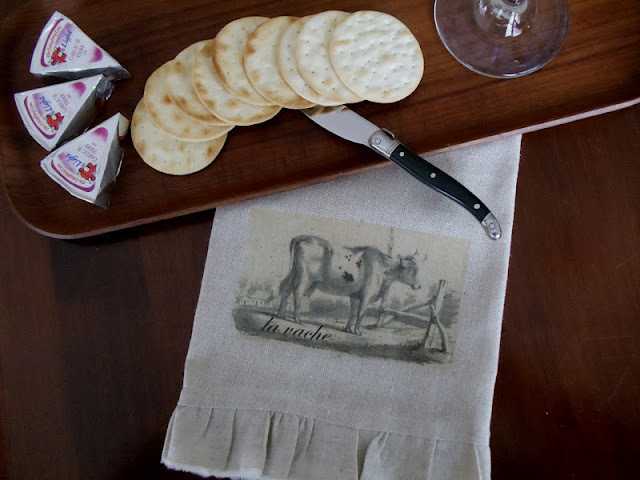 I love trays and that cow napkin is charming. what a wonderful collection!!!! love them all especially the one with the little doggie!!! my grandma had a tole tray just like that only in black -- it is now mine an i love it!!! sending hugs! 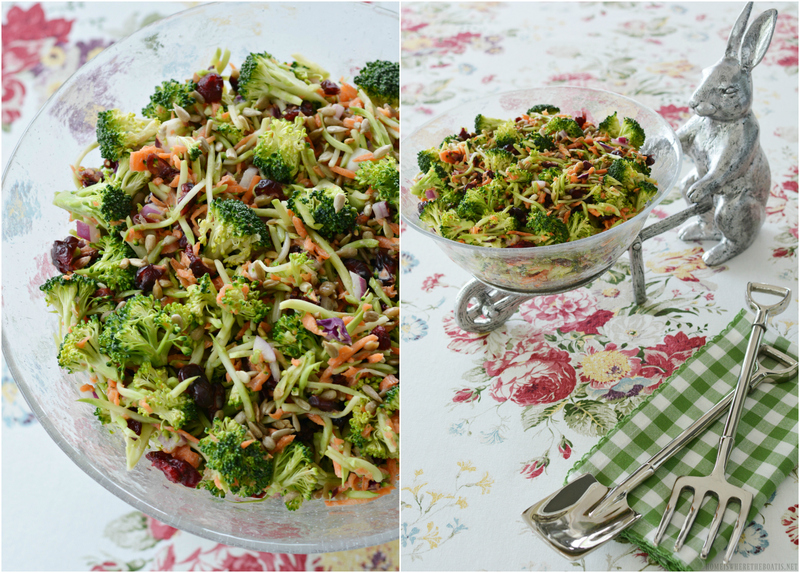 Oh, I adore trays! I like your birch and twig tray, very unique. Gorgeous trays! I love them ALL! You can never have too many trays or baskets can you? Your collection is great! I actually remember the bamboo tray from the 70's! Babs~ I love your dog portrait tray with or without legs :) I probably have more than I realize~ they serve so many purposes and I used to have a stack of bamboo ones! Love the texture of your birch lined one~ your ladybug is good luck! Wonderful trays Babs. When I was at All About Home last week, I saw a couple I liked and may have to go back for them. Love your trays! They are so practical and can be used for so many purposes. Babs, your tray collection is super! I don't think anyone could have too many, they are so useful! I have not seen a little ladybug in a long time...I do think they are sooooo cute! when I was single years ago I ate many a meal off my bamboo tray! 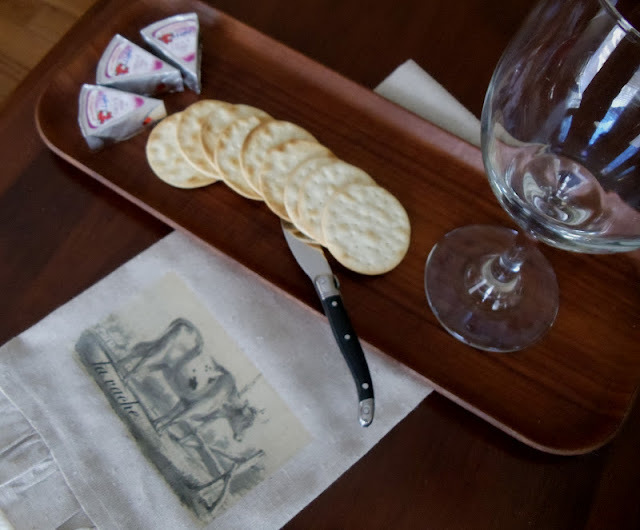 I adore the doggie tray! How sweet! I love the tray and the vignette. My next magazine copy cat challenge will be March 12 and this would be a perfect addition to the party. your trays are very cool, have to say I remember the bamboo one also! You have a good collection and the best part is they can be used in so many different ways! The dog tray is my favorite! I like your assortment too. I have one that I love, a tiled one, but when I load it up it is very heavy. Have a great weekend, Babs. 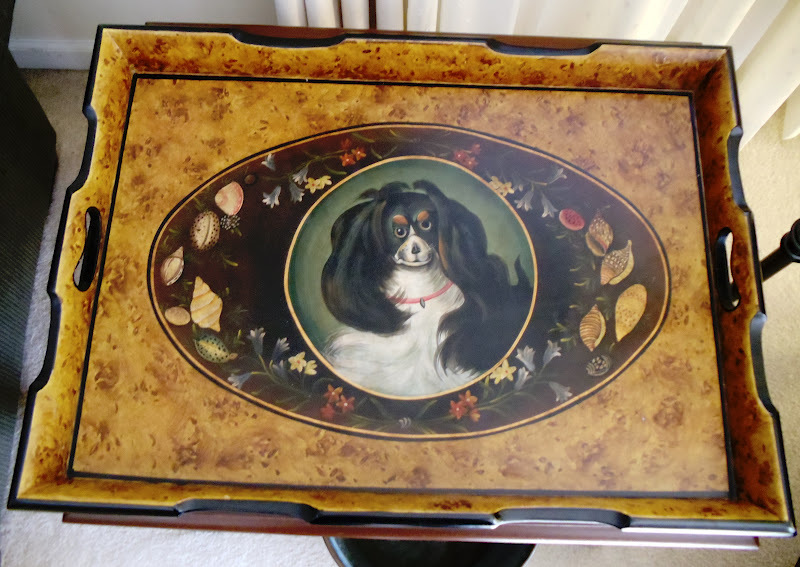 Love that doggie tray found at GW. Who need legs? I too love trays, but I think you may put yours to better use! The last one is my fav, with the little doggie. And by the way, I like your sofa better. It's just their Spring pillows that give a different look.